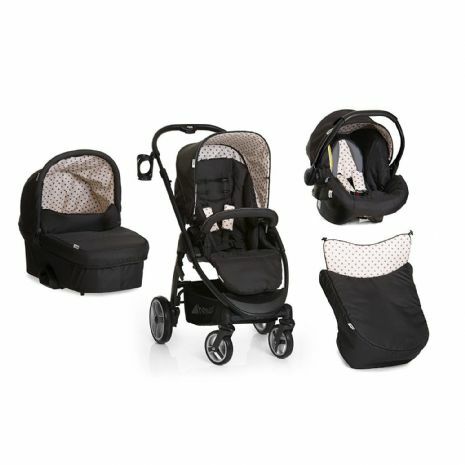 The Lacrosse All In One travel system provides you with everything you will need to accommodate a newborn until toddler age. The Zero Plus comfort car seat (included) means that you will be able to transport baby home from hospital, and by means of the Easy-Fix system, secure the car seat to the Lacrosse chassis to create a practical shop n drive system. In this way, you do not have to wake baby up when you are getting them in and out of the car. The hard carrycot secures to the chassis in the same way as the car seat and provides newborns a comfortable and safe environment for them to lie in when out and about. When baby is too big to be contained safely in the car seat or carrycot (or when you think that they will enjoy a more traditional seating position) the reversible seat unit is attached to the frame in either direction, so that you can choose whether baby faces you or faces forwards (2 way facing). The large wheels make the Lacrosse equally suited to all types of terrain, whereas the adjustable seat unit and removable & reversible liner ensures high levels of seating comfort. The Lacrosse is small folding and a raincover, mosquito net, boot cover and cup holder are all included within the package for your convenience.